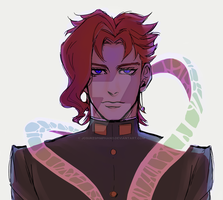 As it's the Leo time of the year, it's Kakyoin Noriaki's birthday (Whatever day that is. I remember seeing a fan speculation that it was the 26th of July?)! Sorry for the lack of replying back to comments, but I appreciate them all. Thank you for taking the time and effort to do so. Next up, I want a sequel with Kakyoin doing​ a "lero lero" thing. Other than that, sweet job! I'm glad that I clicked on this out of curiosity. You did such a wonderful job. The colors are a big strength of this and I absolutely love how that cupcake and cherry came out and that it fits the theme of this picture very well. His pose looks very good too. along with his hair and eyes. Is a super pretty fanart! I love it! the sparks Well done! Happy Birthday my beloved cherryboy!! !